Maui received several 2019 TripAdvisor Traveler's Choice awards. The most esteemed award ranked Maui as the #2 Top Destination in the U.S. New York City ranked first. Kaanapali Beach earned the title of #2 Best Beach in the U.S. The top beach was Clearwater Beach in Florida. Kaanapali Beach also ranked #14 for the World's Best Beach. Wailea Beach ranked #17 on the Best Beach in the U.S. list. Hotel Wailea made it on two top hotel lists, #10 on the Top Luxury Hotels in the U.S. list and #17 for the Top Romantic Hotels in the U.S. list. Southwest Airlines which launched its inaugural flight to Hawaii last month made the list as #6 for Top Airlines in the World. P.S. - Online filing is now available for Maui county property owners. The Maui County site can be used to submit change of address, condo use declaration and home exemptions. Two 3 bed, 1.5 bath homes on 2 beautiful acres with a large ocean and mountain views. Poko Place is only about 5 minutes away from Makawao town with all the shopping, convenience stores and entertainment. Mesmerizing ocean views from this front row 3 bed, 2.5 bath contemporary residence in the exclusive Kaanapali Hillside neighborhood of West Maui. The home was thoughtfully constructed with floor-to-ceiling windows and skylights to maximize natural light and obtain ocean views from every area of the open plan second floor living space. $1.795M (FS) Rare opportunity to purchase two Front Street homes on one parcel. The ocean side 3 bed, 2.5 bath home enjoys a spacious open concept floor plan, vaulted ceilings, remodeled kitchen, expansive covered lanai, ocean vistas and spectacular sunsets. The mountain side guest house has 1 bed, 1.5 bath upstairs ohana, a separate 1,128 sq ft flex room (study, exercise, yoga studio) and a 1,728 sq ft garage/workshop offering multiple opportunities. $3.9M (FS) Enjoy modern oceanfront living in this charming beach house on Front Street in historic Lahaina town. This recently renovated 3 bed, 3 bath home enjoys a direct oceanfront location and has fresh, beach chic design. The rooms are bright and airy, with stunning hardwood floors. Spacious screened-in covered lanai makes for nice outdoor living, just off the interior living room and kitchen area. Vaulted, open beam ceiling. Get cozy and enjoy the wood-burning stove on cool evenings. Nice, clean, ready to move in 2 bed, 1 bath home. Large wide open 10,547 sq ft yard with tons of room and a cute updated 2 bed, 1 bath cottage. Set way back from the street on a private drive, this home is just waiting for you to call it home. Fresh paint, new light fixtures and appliances. Bank Owned - 181 Nalani Street is the perfect home for the first time buyer or that buyer that is looking for a smaller 3 bed, 2 bath home to maintain. You will enjoy the cooler climate that Pukalani has to offer. The home offers a small ocean view and is ready to be moved into. Centrally located in the heart of Kahului, conveniently near stores and restaurants. Property consists of a 3 bed, 1 bath main house with recent upgrades and newly painted interior. There is a 1 bed, 1 bath detached ohana with a bonus loft, a spacious 10,650 sq ft lot with lots of potential and a permitted utility shed. $769K (FS) Amazing location in historic Lahaina town, walking distance to the beach, Lahaina harbour, shops, restaurants, Banyan Tree Park, museums, historic sites and many other amenities. Full duplex with 3 beds and 1 bath on each side. Currently rented month to month. $1.05M (FS) This completely remodeled 1 bed, 1 bath, 792 sq ft unit provides the highest level of attention to quality and detail. As you walk in, you will feel the warmth from the velvet textured Italian plaster and appreciate the high ceilings with natural Lau-Hala and bamboo. $1.199M (FS) Featuring one of the most iconic ocean view corridors on Maui, Royal Mauian 503 is a rare opportunity to own on Kihei's golden mile. This 2 bed, 2 bath oceanfront luxury condo offers an open floor plan with seamless indoor/outdoor living. Meticulously maintained, the vacation-rentable condo is well appointed and has a split-system air conditioning system. Makena Surf is considered by many to be the exclusive oceanfront and beachfront condo project in the world famous Makena Resort on Maui. If you truly want oceanfront living, you will be amazed how close you are to the crystal blue Pacific in this 2 bed, 2 bath home. They don’t make them this close to the ocean anymore. Prime direct beachfront location, ground floor, corner, 2 bed, 2 bath unit facing Black Rock at the Whaler on Ka'anapali Beach. Step out onto your covered wrap around lanai and watch the whales, waves and sunsets as you look out towards the islands of Lanai and Molokai. A huge grassy lawn is right out your sliding doors and you are mere steps from the beach, pool and all that Kaanapali has to offer. From the moment you walk through the door of this 1 bed, 1 bath condo you will be amazed by the views and gorgeous sunsets. You'll see from the top of the crater all the way to the ocean from the magnificent lanai. Beautiful top of building 1 bed, 2 bath condominium with ocean and West Maui Mountain views. Remodeled kitchen cabinets in 2006, bathrooms 2009, Maui built bedroom furniture in 2014 and new flooring in 2018. Kitchen cabinets are custom frame-less made of maple, porcelain tile flooring and under mounted sinks. This cozy 2 bed, 2 bath condominium is located in the heart of one of Kihei's most popular vacation rental resorts, Kamaole Sands. It has been lovingly maintained and cared for over the years. From the remodeled kitchen and baths to the bright and open living room with an extra window for more light. Unit 4-413 has the highly desirable 69 sq ft lanai so it is essentially an outdoor living space. Beautiful ocean, outer island and Haleakala views from this second floor, 2 bed, 2 bath brand new unit. This unit is unfurnished with 2 parking spaces, and additional storage in the car port. Beautifully situated on over 6 acres of ocean view property, this Na Hale O Makena 3 bed, 2.5 bath condo is on the ground floor, making it easily accessible from the beach across the street, as well as nearby resort shopping, golf courses and top rated restaurants. Maalaea Mermaid has the perfect amenities, one of best surf spots in the world, whale watching, Haleakala and ocean views, fee simple, a secure building, 714 sq ft and does not allow for short term rentals so residents have their peace and quiet, day and night. This is a 1 bed, 1.5 bath home. $579K (FS) Welcome to Milo Court in Kehalani. 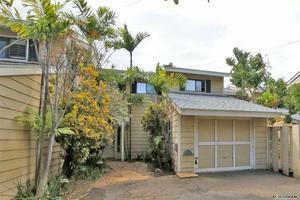 This 3 bed, 2 bath Ho'omalu floorplan lives like a single level, only entry way and garage is located downstairs. Enjoy a peaceful retreat under the gazebo in your private, fenced in back yard oasis with your pets in this pet friendly complex. Bank owned - This townhome at Auhana Kuleana is in a great location, just one block from Cove Park, Kalama Park, restaurants, shops and virtually every amenity. This spacious two-story townhome has the living area, kitchen, laundry and garage on the ground floor, with all 3 beds and 2 baths upstairs and a half bath downstairs. Build your dream home in Waikapu. One of the last remaining vacant lots in Waiolani Mauka. Centrally located. County Water Meter installed, underground utilities. Exceptional Haleakala and West Maui Mountain views. Ocean view potential from a two story house.